That, apparently, is the answer to the question we adults were debating on Wednesday at the Elevate conference in the seminars about tackling children’s inactivity. I collected my daughter from nursery straight after the event, and we celebrated the sunshine with an impromptu trip to the park with three other children from school. For two straight hours, those four 3-4 year olds ran back and forth the ¼ mile length of the park chasing bubbles, chasing after each other, pretending to be bees, and racing to see who could find the most twigs from under the trees. Two. Full. Hours. And my 9 month old spent most of his time desperately crawling after the big kids faster and further than any sub-1 year old human should be allowed to move. We didn’t have fancy (or any!) toys, the parents didn’t coach them to play a game, and they never even made it to the playground. So give them space (and a little sunshine to fuel the imagination! ), and they will run… right? Why does it have to be so hard? Kids are clearly hardwired to run and jump and skip, so why do we public health professionals have to sit in conferences trying to figure out how to get kids to move? Why is there an entire industry trying to convince grown-ups that our bodies still like to move? Obviously my anecdote is oversimplified, and it requires access to green space, adults who are willing and able to bring the kids out to the safe green space, enough time after homework considerations… and on and on come the barriers that contribute to inactivity in children. I know. It’s an extremely complex web of causality. Yet I couldn’t help but contrast the simplicity and sincerity of these kids running around buzzing at each other alongside the complex fitness equipment showcases and seminars on tackling inactivity in youth that I participated in earlier that day. I’ve had the pleasure to see first hand at our partner schools Torriano Primary and Argyle Primary that when the school grounds are kept open after the school day for kids to have a play on the playground while parents have a chat, that playground is packed from 3-4pm nearly every day. Kids want to run and play, and the key to the obesity and inactivity crisis is to *keep* these kids wanting to play and giving them opportunities to do so. I must say, while I am sad about its necessity, I was pleased to see at the Elevate arena this week that tucked in between the 147 other exhibitors of goodies and gadgets to get the grown-ups moving, there are innovative folks like Tagtiv8, Imoves Dance and Action Mats as well who are determined to bring the natural affinity children have for being active into the classrooms. 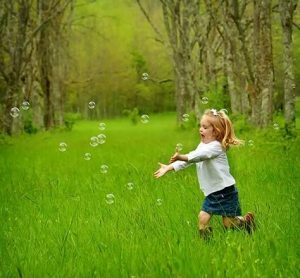 For all those of us who have kids in our lives, let’s make it a point to grab some bubbles, a stick and find some grass this weekend to help keep this generation of kids active. After watching those preschoolers run lengths of the park for hours, I no longer have any doubts about whether or not my 3 year old is ready for the Junior Parkrun, so that’s where we will be! With some bubbles in my pocket just in case.